The gemstones: Jasper, Garnet, Smoky Quartz, Obsidian, and Black Tourmaline. 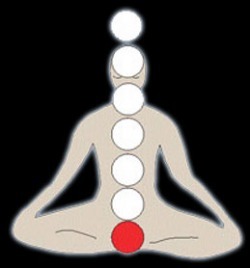 The root chakra is located at the base of the spine at the tailbone in back, and the pubic bone in front. This center holds the basic needs for survival, security and safety. The root chakra is powerfully related to our contact with the Earth Mother, providing us with the ability to be grounded into the earth plane. This is also the center of manifestation. When you are trying to make things happen in the material world, business or material possessions, the energy to succeed will come from the first chakra. If this chakra is blocked an individual may feel fearful, anxious, insecure and frustrated. Problems like obesity, anorexia nervosa, and knee troubles can occur. A man¹s sexual organs are located primarily in his first chakra, so male sexual energy is usually experienced primarily as physical. Women’s sexual organs are located primarily in her second chakra, so female sexual energy is usually experienced primarily as emotional.